With a glowing reputation as the treasure of Val d’Arly, Notre Dame continues to attract wintersports fans from across Europe. You can look forward to a charming atmosphere, great facilities and a variety of amazing runs to suit all kinds of abilities. It is located near the Mont Blanc region, between the Aravis and the Beaufortain ranges. Notre Dame is an authentic alpine village that offers a lot of charm, with a preserved architecture. You will not find any high rising building or big shopping malls here. While Notre Dame typically appeals to skiers of all ages, it is ideal for families. The low-key resort has all the facilities needed for a relaxing winter break. The chalets here are wonderfully cosy, offering magnificent views over the nearby landscape of stunning forests and mountains. On top of this, the village’s lift system makes it easy for visitors to explore all of the runs available and properly develop their skills at their own pace. The ski season here runs from December to April and all of the runs are immaculately maintained, ensuring a smooth surface for skiers. There are some excellent runs for visitors to choose from across Notre Dame, ranging from tree-lined runs to open bowls between altitudes of 1,150m and 2,069m. There is 185km of piste overall, offering an excellent variety of slopes to suit everyone from beginners to experts. 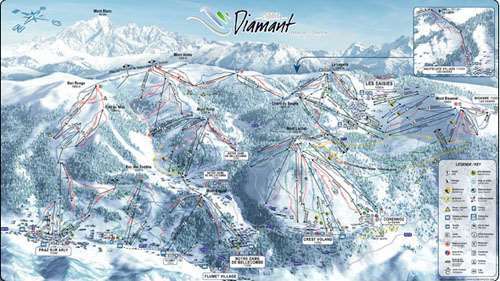 What’s more, ski passes are available that provide access to Crest Voland Cohennoz, Flumet, Les Saisies and Praz Sur Arly, all of which are within the outstanding Espace Diamant region. As the resort is particularly small, it will not be overwhelming for newcomers and its simple layout makes it easily navigable for all visitors. The apres ski scene here is very low-key, but it is fitting for the cosy area. There are around a dozen restaurants in the region, all of which provide a magical atmosphere and perfect relaxation. If you’re looking for activities away from the slopes, snowshoe hiking and film evenings offer great fun and there is even the prospect of night skiing to music!